Originally, there was just iMovie, released in 1999 as a Mac OS 8 application. iTunes, iPhoto, iDVD, GarageBand and iWeb gradually filled out the ranks. The first three were free, while iDVD was available only on computers that used Superdrives. In January 2003, Apple released the set packaged as iLife, and has continued each year to release updated versions. It’s been a few months now since Apple released iLife ‘08, and the dust still hasn’t settled. Never have I seen quite so many ‘flaming’ postings on the Apple forums. So what’s the controversy? For many users, it’s probably “much ado about nothing,” but for the old time iMovie power user, it’s a betrayal. iMovie, you see, though still called ‘iMovie,’ is in fact a completely new application. Many people think the re-write should have been called something like iClip, instead of iMovie, for it neither looks, feels, nor works like the ‘old’ iMovie. Which isn’t to say it’s bad: in fact, it’s quite good at what it does. 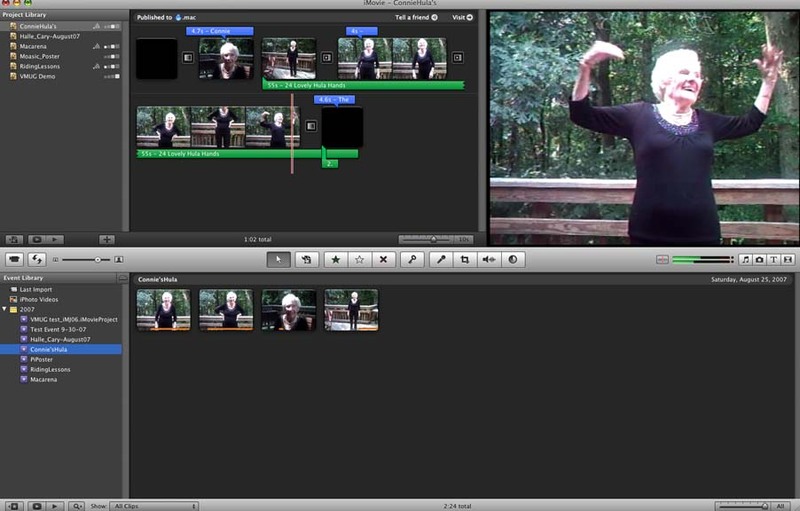 Think of iMovie ‘08 as iPhoto for video. Essentially what Apple has done is this: they’ve said, you know how to make a slideshow using iPhoto? Well, now you can make a ‘video slideshow’ using iMovie ‘08! To understand what Apple has done with iMovie ‘08, it’s useful to look first at iPhoto. Instead of ‘Rolls’, iPhoto now organizes your photos in ‘Events’, which is a bit more than a Roll by another name. The idea is this: you go to an ‘event,’ a wedding, a birthday party, whatever, and you take a bunch of pictures. When you import them, they’re organized into Events, which you are prompted to name. If at the wedding, you went to two events -- a rehearsal dinner and then the wedding -- you can select the first picture in the wedding sequence, and ask iPhoto to create a new Event. You can merge multiple photos into one Event, or conversely, split one event into many. Note -- and this is important -- what you see in an Event is essentially a grouping of the photos in your Library: it is not an Album. This means that, if you delete a photo from an Event, you are deleting it from your Library! If you want to move a photo, or a series of photos, from one Event to another, do this: select the images you want to move. ‘Copy’ them. Hit Delete, and they are gone. Then ‘Paste’ them into whichever Event you choose. If you are really, really cautious, ‘copy and paste’ them first, then go back and delete them. The coolest thing about Events foreshadows what you’ll see in iMovie. Apple calls it ‘skimming.’ When you create an Event, a series of photos taken at a birthday, for example, roll your cursor over the Event, and you’ll ‘skim’ or scan through the thumbnails of all the images in the Event. And if you want to select a particular one for the ‘poster’ image in the Event, pause on it and hit the ‘shift’ key. “Bang,” as Jobs would say, and it’s done! Another cool feature of iPhoto ‘08 is the editing tools. It’s not that many are new, it’s that they seem to work so much better. Unless your image is really bad, the enhanced Edit tools can make it acceptable. If you are a .Mac subscriber, you’ll find that Apple has optimized the iLife Apps to work best -- or at least easiest -- with your .Mac Web Gallery, thus justifying for many the $99 yearly fee. For this you get, among other things, a bump from 1 to 10 gigabytes of storage. Using Web Gallery with iPhoto couldn’t be easier: select an Event, and then click “Web Gallery.” Choose whether to make the gallery or Event private, select user names and passwords, and upload the photos in the Event. Once uploaded, you can click a link within iPhoto that takes you to the Event in the Gallery, and you can view it in almost the exact same way as you do from within iPhoto. You can even use Event Skimming. If you allow it, your family and friends can download the photos -- full size -- or even add to the gallery themselves by uploading photos or emailing them to your gallery’s email address. iMovie ‘08, technically, is 7.0. But we’re going to call it iMovie ‘08,’because that seems to have become the convention. First impressions, based on an hour weeks ago in front of a new iMac at the Apple Store, Tyson’s Corner: Dazzling images, absolutely dazzling. It was hard to look past the sharpness, the clarity, the just plain breathtaking 'look' of the images -- all HD, all in 16:9 widescreen format. Figure 1 shows you just exactly what that image looks like. At the same time, I was puzzled by the layout. I knew it wasn't the old iMovie. -- I'd seen the tutorials, read the manual -- but it was still odd to see it look so different. I kept looking for the timeline, and there isn't one. And for anybody who has spent any time with any movie-editing program, the absence of a timeline is a jolt. Even as I played with the clips in the iMovie Project window, the one on the upper left, learning how to move them, re-arrange them (hint: select, then click and drag), learning how to trim them (hint: click on the little teeny icon on the bottom left of the frame, and a trim window opens), it didn't dawn on me what Apple -- or the mysterious engineer who went scuba diving and then was inspired to re-invent iMovie -- had done. I'd been playing with the clips in the Project window for several minutes when it dawned on me: Apple had change the paradigm! No longer is iMovie based on the idea of a timeline. Let me explain what I mean. There are essentially two fundamental ways to organize your clips. One is the time-honored timeline, in which you arrange your clips along a line, a timeline, from left to right. The other way to organize your story, now widely used in Hollywood, but derived -- I'm guessing -- from animated movies, and now almost universally done, in movies, in TV productions, is the storyboard. With a storyboard approach, you create a series of sketches of something representative of each scene. Then you move them around until they tell the story you want to tell. You can arrange them chronologically, from beginning to end; you can arrange them with an ending clip first, then flashback to tell the story; you can arrange them in whatever order that best tells the story that you want to tell. Once it hit me that all they had done was change the paradigm, then the new iMovie began to fall into place. iMovie ‘08 is not a little bit different from iMovie 06, it's completely different, and different from any editing software I've ever seen -- different from Premiere, from Avid, from Final Cut Express or Pro. In fact, to call it iMovie is to give the wrong impression. It's not the old iMovie re-visited, in any way, shape, or form. As I said, it has no timeline, at least not any conventional sense. Instead, making 'movies' with iMovie ‘08 is more like making a slideshow in iPhoto for upload to the new .Mac Web Gallery. One powerful new feature, 'skimming,' allows you to slide your cursor over the thumbnails of your video clips, not in real time, but faster than real time! You can zip back and forth through all the footage you've shot, literally hours of it, in seconds, stopping to selecting a piece here, a snippet there, and dragging or sending them from the Events Library to the Project Library, where you then arrange or re-arrange them in whatever order you want. You drop and drag in a few transitions, add a title, choose a sound track, and you're done. What the new iMovie wants you to do then is push this new creation – which, when you think about it, looks suspiciously like a 'music video' -- to iTunes and to the .Mac Web Gallery. With a click of a button, a drop-down menu appears: you can choose to save it as Tiny -- 176x144, Mobile -- 480x360, Medium -- 640x480, Large -- 720x540, or in most cases all four sizes. (Note: exact sizes vary depending on the type of movie project you select, Widescreen, iPhone or Standard.) From iTunes, you can move your movie to your iPod, your iPhone, or Apple TV for viewing on your large screen HD TV. From the .Mac Web Gallery, you can share with family, friends, or anyone. You can even push your creation to YouTube with the click of a button, should you so desire. All this is not to say that you cannot create more conventional, longer movies. You can. You can select any or all of your clips, not just snippets. I'm not sure yet exactly how you could exactly control the length, but I suspect that with a little ingenuity it could be done. You can create some very impressive titles, even with the few templates Apple has provided thus far. The palette of transitions is limited, compared to all the plug-ins many of us loaded in the old iMovie, but this is probably a blessing in disguise. Many people over-used transitions anyway, and so one could convincingly argue that in this case, less is more. But I would urge you to try iMovie ‘08. Just the potential for organizing one's video, into easily accessible Events, seems to me to be a promising development. It does take the patience of Job to move video into the iMovie Library, but when you think about it that shouldn't be a surprise. Video clips are huge files, and it just takes time to do whatever they do to create the thumbnails, the Events, etc. 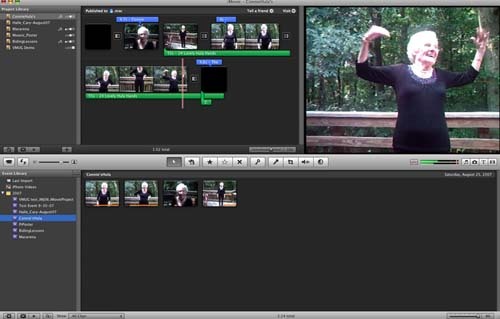 What’s happening: iMovie ‘08 uses reference files, like Final Cut, rather than duplicating the video over and over as the old iMovie sometimes does. This makes sense, given the huge file size of just mini-DV; add HD video, and it would easily overwhelm even the largest storage system if it were not carefully managed and controlled. Overall, I've gone from surprised, I guess, then fascinated, to more than a little impressed. With its new iMovie, Apple again has come up with something completely original, very simple to use, stunning to look at – well, this does assume you shot decent video! -- and elegant in its execution. 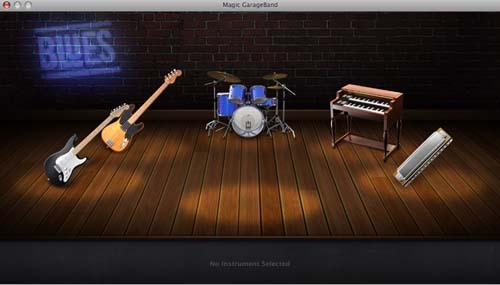 The coolest addition to GarageBand is the audition feature that’s been added to Magic GarageBand, which is shown in Figure 2. Choose a genre -- alas, there are only 9, and therefore only 9 tunes to choose from, but these include Blues, Rock, Jazz, Country, Reggae, Funk, Latin, Rock, and Slow Blues. Curious as to the difference between Blues and Slow Blues, I started with Blues, clicking on the ‘Snippet’ button, and was greeted with a stage full of instruments, and what seemed to me the raucous wail of a harmonica. Sure enough, that was one of the lead instruments. Clicking on that brought up several more instruments to audition -- a kind of guitar called a ‘swampy slide,’ another called a ‘hollowbody,’ and a third called a ‘biting slide.’ As the blues tune loops, you can click on and therefore select different instruments to take different parts. Once you are happy with your selection, you can move into GarageBand proper and add other tracks to further personalize the tune. By the way, Slow Blues is just that: a somewhat less raucous piece, led by an arrangement of horns. One other neat feature is this: you can import your iMovie into GarageBand, and tweak the sound track to your heart’s content. Why would you want to do that? Because, as mentioned, the new version of iMovie does not have the traditional tracks for video and audio. While you can add separate music tracks to your iMovie ‘08 project, you do lose the control you had in previous versions -- for example, no longer can you ‘rubberband’ the track to raise or lower the volume from within iMovie ‘08. But you can export the project to GarageBand, which gives you even more control than you had previously. Overall, GarageBand is an incredibly well made - and very powerful - tool, designed to fit your needs whether you're creating a podcast or an orchestral masterpiece. It does have a steep learning curve, but if you stick with it, you’ll find your time is well spent. Until there is a decision on Blu Ray vs HD-DVD, Apple appears to have decided to let sleeping dogs lie. Except for a few new templates and higher quality video, iDVD remains pretty much as it was - a solid workhorse, capable of producing as stunningly professional-looking DVDs as before. Curiously enough, the direct link from iMovie to iDVD has been removed. You can still save a project in iMovie, and import it into iDVD and burn a DVD from there just as you could in previous versions, but the direct export link to iDVD no longer exists. To do this, first, in iMovie, choose Share>Media Browser. 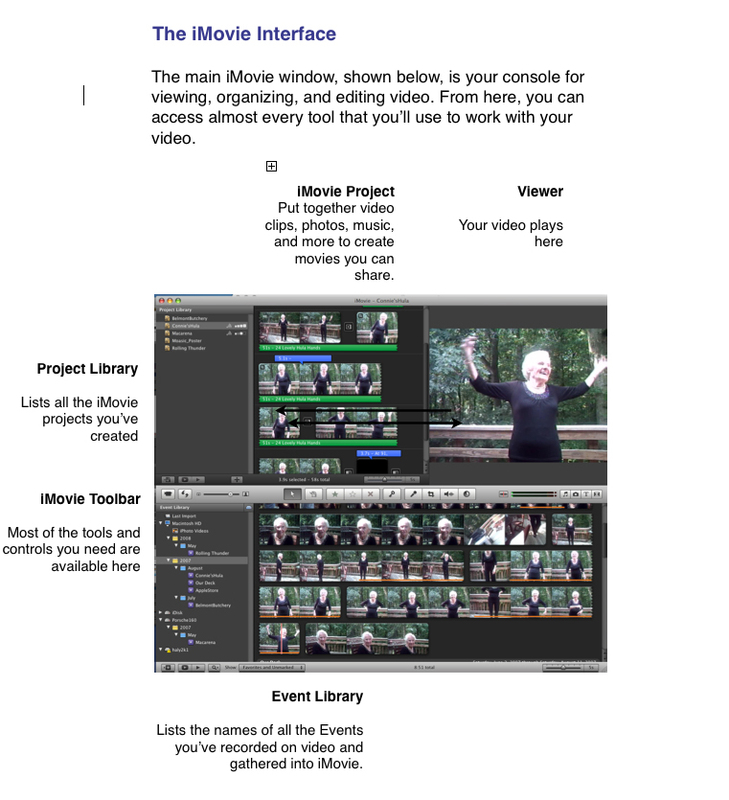 Then, open iDVD, choose your theme, set up the templates, etc., and click on the Media tab, and there you will find your iMovie. Interestingly enough, Jobs made it clear in his keynote speech that he expected users to post their home movies to their .Mac account, where it can be seen in what he called ‘HD’ quality, rather than burn them to DVD. As it turns out, what Jobs expects, and what many of us do, may be two entirely different things. iWeb, as we demonstrated at the July 2007 General Meeting, is a remarkably easy- to-use tool for beginners, or even those who want to quickly create a professional looking Web site or blog. Given that you plan your Web site, and organize the material -- the photos, the videos -- that you want to use, the included templates made creating an attractive website easy. More advanced users will probably want to use another application.